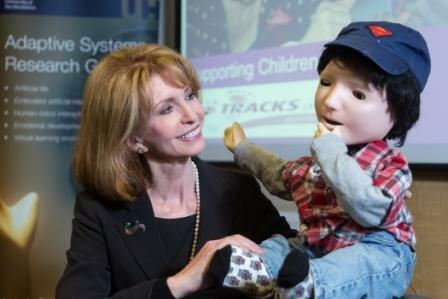 Actress and author Jane Asher, President of the National Autistic Society and Patron of TRACKS Autism, met KASPAR at the University of Hertfordshire’s Supporting Children with Autism Healthcare Forum 2013. KASPAR is a minimally expressive humanoid robot designed by researchers at the University to encourage communication and social interaction between autistic children and their peers. Over 150 people who have an interest in supporting children with autism came along to hear Jane discuss the issues affecting these children and the impact on their lives and their families, and to find out more about the University’s research in this area from Professor Kerstin Dautenhahn.